Kingsdown Conservation Group (the Group) would like to emphasise that it does not criticise the desire of the Hospital Board to ease the difficulty some people have when travelling to the various Hospital buildings; it is the particular solution proposed that is objectionable. In its letter of 8th November, the Group strongly objected to this application. The letter argued that the proposal was in direct conflict with the Joint Transport Plan and the Bristol Core Strategy, that it involved the demolition of the existing multi-storey car park and all 36 of the fundamentally sound flats on Eugene Street and that it adopted an approach of demolition, clearing and re-building which has been entirely discredited for inner city development. In this second letter, the Group wishes to add that the proposal is also in direct conflict with a number of other BCC policies. 6.2.1 The topography of the City is unique and views across it make an important contribution to Bristol’s townscape and character. The spectacular City-wide views enjoyed from Kingsdown are fundamental to its special interest. 6.2.2 . . . The tall houses on the escarpment can be seen from many points across the City. 6.2.3 . . . The preservation of Kingsdown’s views is vital in protecting the area’s character and special interest. New developments within the City centre, … the Hospital and University sites, are all posing a significant threat to Kingsdown’s views. With regard to the above, it is unfortunate that the Accurate Visual Representations (AVRs) in the Design and Access Statement are from selective viewpoints. There are neither views from the west end of Dove Street nor from Dove Street South. Similarly, there are no section drawing showing the proposed car park in relation to the topography of Kingsdown. These views and sections are important to enable all to comprehend the impact of the proposed multi-storey car park on the townscape setting. It is a matter of frequent comment that the above proposal is an application to fill in the last significant uninterrupted gap between the Hospital buildings on St Michael’s Hill to the west and the Dove Street flats to the east. An anachronistic and illuminated eight-storey car park would mark the final obliteration of an essential element of Bristol’s topography, the escarpment of Kingsdown. In the face of the city’s recently declared popularity as a place to live and visit, surely, it cannot be Bristol’s policy to submerge its topography and heritage assets in a rising tide of massive generic buildings. This is our response to the proposed UHB multi-storey carpark. We hope that as many residents as possible write in and express their opinion on this planning application. This is a link to the relevant on line comment page. 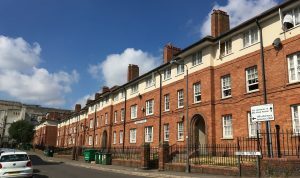 Kingsdown Conservation Group is aware of the difficulties faced by those who need easy access to the wide range of buildings administered by UHB. However, it regards the proposed solution as obsolete. Times have changed. Local roads are highly congested and pollution levels are excessive. Smarter solutions must be found and the city is concentrating on developing new ways for people to travel. The proposed multi-storey car park would conflict with the joint transport plan. In the context of its agenda to keep expanding clinical provision annually by between four and five per cent, the Trust should integrate its thinking and decision making with existing parking provision and emerging modes of transport. The Trust cannot remain trapped on a treadmill of attempting to accommodate an ever increasing numbers of patients’ cars. In addition to the above aspect of the proposals, the Group is shocked to see that the brief has remained effectively unchanged since the idea was floated several years ago. The idea of demolishing 36 fundamentally sound, purpose-built flats is repugnant. The idea of demolishing a functioning c.160 bay multi-storey car park, in order to build another multi-storey car park alongside, is wholly offensive. All the proposed demolition is unsustainable. The Planning Statement raises The Bristol Core Strategy, as if to imply accordance, yet the proposals conflict with it, including elements of BCS5, BCS10, BCS15, BCS20, BCS21 and BCS22. The proposal’s conceptual approach of wholesale demolition, clearance and re-building would repeat town planning errors made across the nation and notoriously on the slopes of Kingsdown, when Bristol’s most important early Georgian suburb was ransacked in the 1950s and 60s. The mass, height and length of the multi-storey car park would assault Kingsdown’s surviving historic townscape by being built to an entirely different scale and, unforgivably, at a low level of the escarpment. Views in and out of the Kingsdown Conservation Area would be obstructed. Both the Grade II Listed Montague Court and the Locally Listed King Edward VII Memorial Hospital building are immediately adjacent to the proposed eight-storey car park and the setting of other heritage assets that are in The Stokes Croft Conservation Area and The St James’s Parade Conservation Area would be substantially harmed by the brash new building. The Group profoundly objects to the proposals and intends to lodge further comment elaborating on certain aspects. Proposed Transport Hub would actually be a monstrous Multi-storey Car Park. 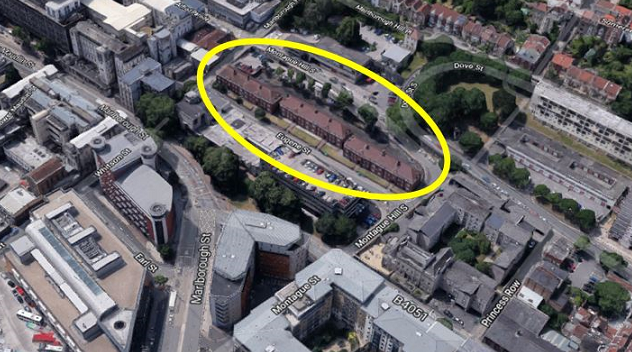 An outline planning application has been lodged to block up Eugene Street, to demolish all 36 of the purpose-built flats on Eugene Street and to demolish the present serviceable c.150 place multi-storey car park, in order to build an 8-storey, 820 place multi-storey car park on the cleared area of ground between Eugene Street and Montague Hill South. Members are advised to look at the application number 18/04977/P on the city’s website or by following the link below. The Conservation Group believes the proposed gigantic structure would assault the topography of Kingsdown and is the most challenging application to confront the Kingsdown Conservation Area since its designation in 1973. The Group will be submitting a letter of objection shortly. 42 Tyndall’s Park Road – The Group has lodged an objection to an application to remove the boundary wall to the street and devote the front garden to hardstanding for three motor cars, in conflict with local and national planning policy. LED Advertising. In common with other local and national amenity societies, we continue to try to resist the advance of illuminated advertisements in conservation areas and in the setting of listed buildings. This month we have objected to proposals to introduce LED advertising panels to bus stops on Triangle West and at eight further locations. 19 Ninetree Hill – We have lodged comment on a current application to extend one of a pair of what may be the earliest remaining, free-standing, semi-detached houses in Kingsdown. 12E Alfred Place – An appeal (Ref: APP/Z0116/W/18/3207120) has been lodged against the refusal of the retrospective application 17/01805/H (which can be seen at www.bristol.gov.uk/planningonline ) to build the roof extension, which can be seen from Montague Place. Individuals can submit their views on-line, check the information and progress using the Planning Casework Service at https://acp.planninginspectorate.gov.uk/CaseSearch.aspx. One should use the last seven characters of the Appeal Ref above to search for this case. Further guidance to taking part in planning appeals is available on the Planning Portal website at www.planningportal.gov.uk/planning/appeals/planningappeals. The Group and many individuals strongly objected to the application. Hospital car park. We fear UBHT intend to purse their misguided ambition to demolish all 36 of the purpose-built flats on Eugene Street and also to demolish their existing 250 place multi-storey car park opposite in order to build an 850 place eight-storey car park. A recent ‘drop-in’ event was well attended by Kingsdown residents. The enormous scale of the proposed construction was not clearly shown in the presentation. The Group oppose this shocking scheme. A 2nd planning application to turn the laundrette into flats was refused, and the applicant’s 2nd Appeal has again been dismissed. The inspector cited the poor quality of the proposed flats and the negative effect the loss of commercial (not specifically a laundrette) use would have on the character of this part of the Conservation Area. 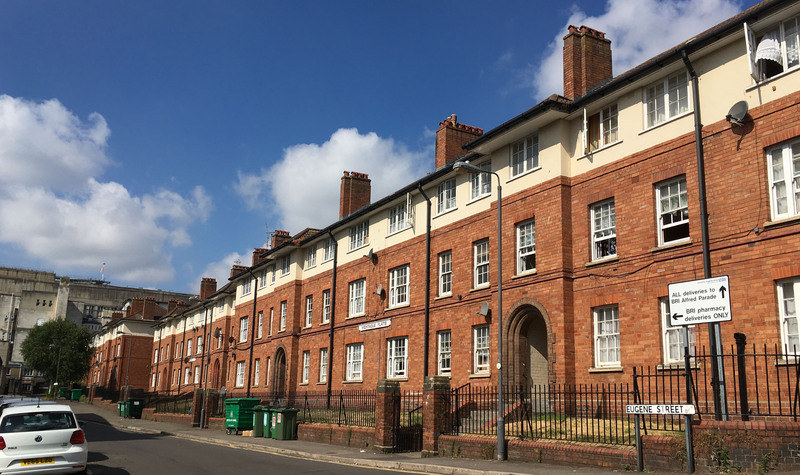 The Redland Cotham Conservation Area Appraisal was published after the previous Appeal and this has strengthened the case against conversion to flats.